If you recall, earlier this year between February and May we had a series of posts detailing the best of Charlotte barbecue in regards to specific meats or dishes. While we’ve had the Charlotte Big Board for a couple of years now, the purpose of these posts was to review individual dishes as opposed to overall restaurant experience. For easy reference, I have compiled the winners of each category in one post. Boone’s Bar-B-Que Kitchen had 3 meats that were best in their category, which helps explain their perch atop the Charlotte Big Board. I still feel very good about the brisket from The Smoke Pit but might reconsider the ribs from Queen City Q in any future revisions to this list, as I have not had a great experience the past few times I’ve gone. One other thing that struck me while composing this post, while Midwood Smokehouse did not win any singular category it was in the top 3 in each of the 5 categories. That would help explain why they are ranked #2 on the Big Board. 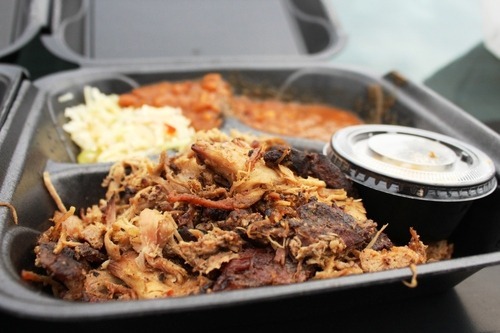 Click here to find all of our posts in the Best of Charlotte Barbecue series. What did we miss? Leave any suggestions or comments below. Speedy: So after Monk panned the Concord Queen City Q location last week, we decided we needed to go back to the flagship to see how it stacked up. In the past, we’ve had pretty good experiences, so we needed to find out if Monk just had a one-off bad experience or if quality had started to slip across the board. Monk: Before Hornets home games, Queen City Q is packed to the gills and the wait time can reach upwards of 45 minutes. Our visit before the final home game of the season was no exception but after waiting in the packed lower bar area, we were able to snag a high top. Regardless of whether the food was still any good or not, it was evident to me that Queen City Q was probably doing just alright in terms of business. Speedy: The sausage at QCQ has always been my favorite meat. And today was no different. The sausage is served split with a mustard sauce and it just works. The meat is finished on a grill and has very solid flavor. It doesn’t try to be anything it’s not with fancy flavors or fillers – it’s just good. So the first meat is a go. Monk: While Speedy considers the ribs to be one of the better meats at QCQ, they were overdone and pretty tough on this occasion. Seeing as how they came in individual bones as opposed to a half rack I wonder if perhaps they had been under a heat lamp after they were cut and that ultimately did them in. Whatever the reason they were just average. Speedy: I was a little disappointed in the ribs as well. They were fine, but not as good as I had remembered. For the brisket, though, I need to find a better word than disappointed. It was flat out bad. It tasted like it had been cooked the previous day and reheated. There was no tenderness to the meat and it took a significant amount of barbecue sauce just to finish. It’s been a long time since I’ve had brisket at QCQ, and it will be a long time before I do so again. Monk: The pork was at least better than the dry, stringy mess I got in Concord. It was tender and moist to the point where I didn’t reach for a table sauce. This was more along the lines of the quality I remembered. Speedy: We had red slaw and hush puppies as sides, which were pretty good. I know Monk was a little disappointed in the sides at the Concord location, but these were both acceptable. Nothing to get too excited about, but they won’t affect my decision on whether to go back. Monk: In my review of the Concord location, I wondered if it was a one-off disappointing experience at a satellite location or an indication of an overall drop in quality for Queen City Q. Unfortunately, with this review I am pretty firmly convinced that it’s the latter. Monk: Ever since our last official review of Queen City Q nearly 4 years ago (and two weeks into starting this blog), they’ve been in full on expansion mode. There is now an additional 3 locations – Concord, Matthews, Ballantyne – and they have become the official barbecue of several local sports teams – Hornets, the Knights minor league baseball team, and the Checkers minor league hockey team – which means that they have an expanded presence in each of the respective stadiums or arenas. They’ve also since severed their relationship with Dan “Boone” Gibson, who has gone on to have (in our mind) the best barbecue in the Charlotte area from his own food truck. With all of these changes, is the barbecue still any good at the expansions? I checked out the Concord location (across the street from the Concord Mills mall) to see for myself. I will saw that even though the last official review was 4 years ago, I’ve certainly been to the original 6th Street location several times since – particularly since dads eat free on Father’s Day. I ordered the Big Q platter and chose pork, brisket, and sausage as my meats. When it came out, the platter was more or less a not-great looking heap of brown meats. The best one of the 3 (and pretty good in its own right) was the sausage. The sausage (not sure if its housemade or not) is split in the middle and finished on the grill. It paired well with the SC mustard I requested on the side. The eastern NC pork was an unflattering shade of brown and just generally lacked flavor. Even adding “Lexington dip” table sauce didn’t help it much. The brisket was plain bad. Now, Queen City Q has always had a slightly unorthodox way of preparing the brisket in that they smoke it, finish it on the grill, and then douse with one of their sauces. In this case, it presumably comes drenched in sauce to hide the fact that it was not smoked very well and had a rubbery consistency. Speedy: Like Monk, I’ve been a pretty consistent customer for the 6th Street location, especially before Hornets games. I’m really surprised by this review, as my experiences at the mothership have always been solid. I agree that the sausage is the best meat, but I’ve been known to order about anything on the menu. I will say that my second favorite meat at QCQ has been the ribs, which Monk did not order. But still – sounds like a disappointing visit. Monk: …Seems like a textbook case of an “official re-review is in order” if you ask me. As for the sides, the eastern NC slaw was nothing you would expect it to be – it contained no mayonnaise and even had a reddish tint to it. In fact, I think they have simply mislabeled it since it’s a Lexington-style red slaw – that or they do not know the difference. The hush puppies were slightly burnt so even though the insides were fluffy the outside left a bitter taste in my mouth. They also threw in a piece of Texas toast which was, you know, toast. If this is a sign of where this local restaurant chain is headed (as opposed to a one-off bad experience), I may have to move Queen City Q way down in the rankings in light of this visit. Very disappointing. Virginia staked her claim boldly in 1988, with a statewide proclamation as this stew’s place of origin, and it has hosted an annual Brunswick stew festival and contest for more than twenty-five years. In a gesture of goodwill, they invite rival stew-masters to bring their crews up from Georgia for some spirited stew celebrations. Georgia staked her own claim by building a monument featuring a massive cast-iron stewpot, which they proudly declare to be the very one in which noble Georgia residents stirred up the very first batch of Brunswick stew back in 1898. The re-brand comes at a time when the restaurant’s owners wanted to take the eatery to a new level – more than that of a barbecue joint. Of course, that barbecue was the cause for much celebration after City Smoke was named the winner of the Carolina Cook Off edition of “BBQ Blitz” on Food Network thanks to Chef Adam Pugh’s rendition of smoked pork chops with cheddar grits. For some years, I’m now prepared to admit, I somehow labored under the impression that Rocky Mount is the line of demarcation that separates the two principal schools of North Carolina barbecue. Wrong. The line of demarcation is, roughly, Raleigh, sixty miles west. The Research Triangle—the area encompassing Raleigh, Durham, and Chapel Hill—is a sort of demilitarized zone, where someone who’s been concentrating on the barbecue scene, as I was on my most recent visit, half expects to see the distinctive blue helmets of United Nations peacekeepers. 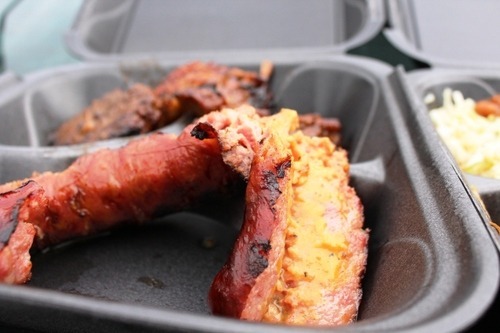 Scibelli says Midwood Smoke Shack would offer 70% of Midwood’s menu that features hand-pulled pork and chicken as well as brisket, ribs, sandwiches and burgers, plus side items such as mac-and-cheese and BBQ baked beans, and for dessert, peach cobbler and banana pudding. – Does Lexington want to brand Lexington-style barbecue to prevent other restaurants outside of the city from diluting the brand?